There are few natural highs that can top a Boston Symphony Orchestra concert in the open-air Koussevitzky Music Shed on a warm, sunny Sunday afternoon, with a program of four beloved masterpieces brilliantly executed by this world-class ensemble, a glamorous international soloist, and a rising young conductor making his BSO debut. 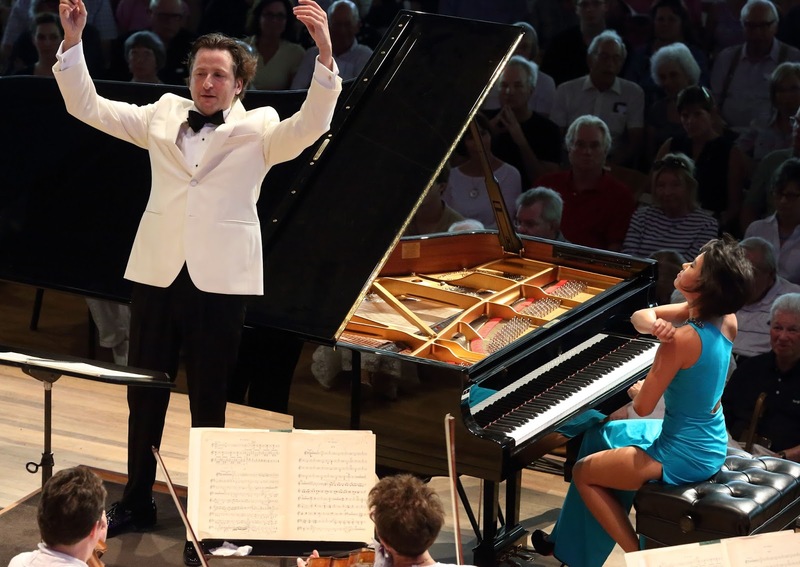 All these elements coalesced when Spanish conductor Gustavo Gimeno led Chinese-born pianist Yuja Wang in Ravel’s Concerto in G and Gershwin’s “Rhapsody in Blue” and the orchestra in Prokofiev’s “Classical” symphony and Stravinsky’s “Firebird” suite. Written in 1916-1917, the “Classical” symphony was Prokofiev’s answer to the question of how Haydn would have composed a symphony if he were alive at that time. It opened the concert on a light and airy note, as a reduced-size BSO played its four short movements with exquisite elan under Gimeno’s suave direction. Ravel and Gershwin met several times in the 1920s and were mutual admirers, Ravel even once asking his would-be pupil, “why would you want to be a second-rate Ravel when you’re already a first-rate Gershwin?” The influence of Gershwin’s jazz rhythm abounds in the lively first and third movements of Ravel’s concerto, where Wang displayed enormous virtuosity. Though her tempo in the second movement was faster than Ravel’s “Adagio assai” marking, she nicely captured the ravishing stillness of its slowly unwinding melody. Her splashy exuberance was even better suited to Gershwin’s rhapsody, written in 1924 at the invitation of jazz bandleader Paul Whiteman. Its opening note on solo clarinet, rendered with sinuous flair by William R. Hudgins, is one of the most famous notes ever written. The entire orchestra, with some notable wind solos, matched his and Wang’s technical and interpretive finesse under Gimeno’s idiomatic leadership. The program closed with a dramatic account of the 1919 suite that Stravinsky extracted from his breakthrough 1910 ballet “The Firebird,” based on a Russian fairy tale and written for Diaghilev’s Ballets Russes. While recalling the colorful orchestration of his teacher, Rimsky-Korsakov, the piece also foreshadows the rhythmic and sonic innovations of his next two ballets, “Petroushka” and “The Rite of Spring.” The BSO and Gimeno gave it their impressive all.